Bill Foss's Kurtis "Mystery Car"
From Bill Foss: " I'd like to post this car, a 1950 Kurtis Sport Car. What I know so far: (1). 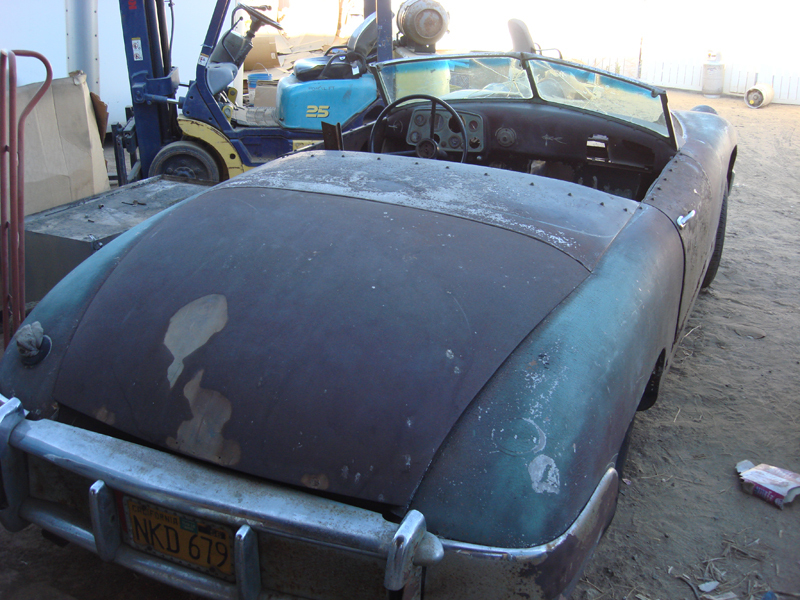 It spent most of its known life at California Metal Shaping, owned by Bill Honda. (2). It had been modified extensively, with mounting tabs for at least three different engines. 3). The owner on the registration was a 19 year old who lived in LA and would have had very little money (now deceased), so I assume the car was bought or given to him in this condition. new owner registered a car. 4). The car had a lot of Von Dutch details. 5). Odd as this sounds, the Hudson I8 had been phased out in 1952, bu you could still buy the engines, as seen in ads from 1952 Los Angeles newspapers. Maybe an inline 8 in a small, very lite, 100 wheelbase aluminum car would have been competitive in some class. an Olds Rocket, which was delivered in a sister car, KSC #14. # 14 was the brother-in -law of Ed Walsh, also good friends with Jack Hinkle. the car. However, the thin spears on the side of the car indicate that car was produced after #12, of the 17 made. KSC numbers 12-17 are all accounted for. In old transcripts, the Kurtis shop supervisor Don Hicks stated that one "kit" was sold, to Jack Hinkle, who then drove it back to Los Angeles to show Frank Kurtis. This could account for the 1956 license plate, as Hinkle lived in Kansas, and was so wealthy that he probably would have used or raced the car very little and disposed of it as soon as something better was available. Hinkle's driver and also mechanic lived very close to the address on registration. 8), The car was fitted with extra Ford dampers on the front and rear, in addition to the stock 1950 ford teliscopic shocks. Not sure why, but they must have felt it necessary. 9). The engine compartment was drilled with holes for cooling, as well as the brake plates were cross drilled for cooling. have been set for circle track style racing, however, the aluminum body panels have never been hit, no dents whatsoever. The would seem to indicate it was NOT jalopy raced. 11). The car never had a top or rear wheel covers. All necessary support brackets were never welded on, as per witness marks. I don't believe this car was ever intended to be a passenger car. That's what I know, so far. Any help would be great - Bill Honda hung on to it for some reason, and it certainly was a mule for someone." 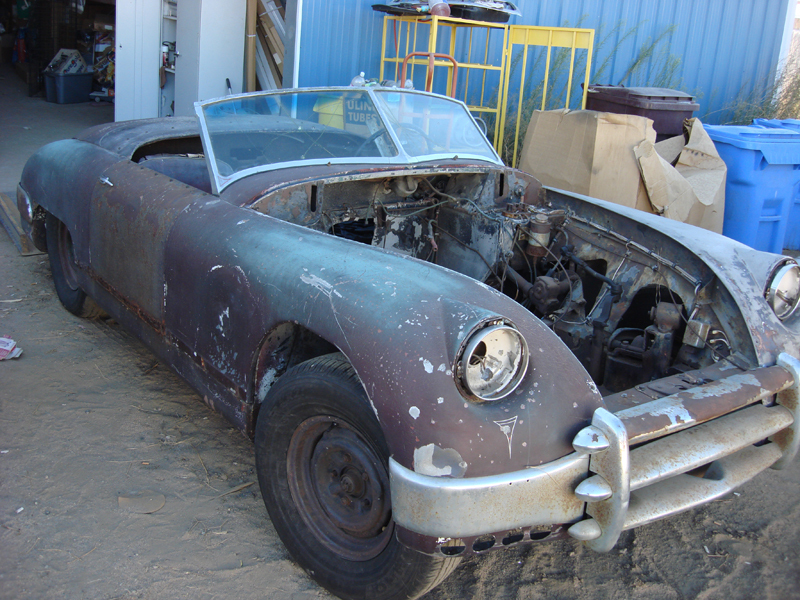 If you can help Bill learn more about his car's history: Please email me! 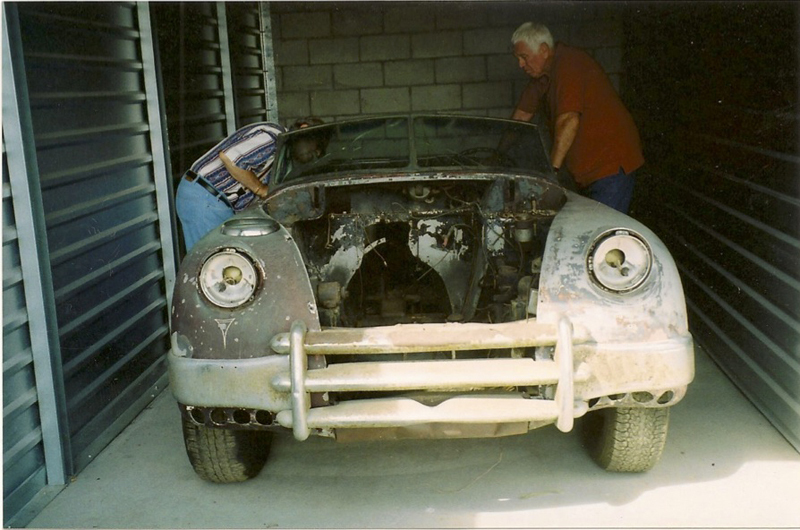 Back to: Wolfgang Kurth's Jaguar "Mystery Car"